Welcome to the latest Railwaymedia blog. Well a week has gone by, or slightly more, and I've managed to take a grand total of 7 railway pictures. I have again though managed to crack on with the re-processing of older pictures, and have finally finished doing all of 2005. These have replaced the older pictures in the various galleries, but I have also created galleries for each individual trip I took in 2005 which can be seen HERE. Working nights gives me a good opportunity to catch up on the computer, but often means I don't get chance to get out with the camera, except if the afternoon happens to be especially sunny. Saturdays are always free but by then I'm normally more interested in having a beer or two! This last weekend I went on a tour of Wetherspoons in West Yorkshire by bus and train. A nice early start for breakfast in Halifax and then by bus through the 'Woollen District' to Cleckheaton, an area I've not visited since I was a student at Huddersfield. I was quite amused by the route branding Arriva have applied to their 268 route from Bradford to Cleckheaton and Dewsbury with every bus having a different Mr Man or Little Miss character. I've since found out that Roger Hargreaves who wrote the original Mr Men books hails from the town, which makes it a little more understandable. Very bizarre seeing them on the buses but at least the local children must enjoy them. Well, this week is back to work on nights once more but I've managed to get out the last two afternoons as the weather has been good. Not too many pictures to show for it though! Monday I went in search of Blackpool's new trams on test again. There are large sections of the newly-laid tramway along the promenade being dug up again, and driving from the southern end at Squires Gate to beyond Bispham without seeing one I assumed there were no trams out. I then passed unbranded 002 heading south. By the time I'd caught up with it it was near North Pier running wrong line negotiating the dozens of metal barriers protecting the worksites. 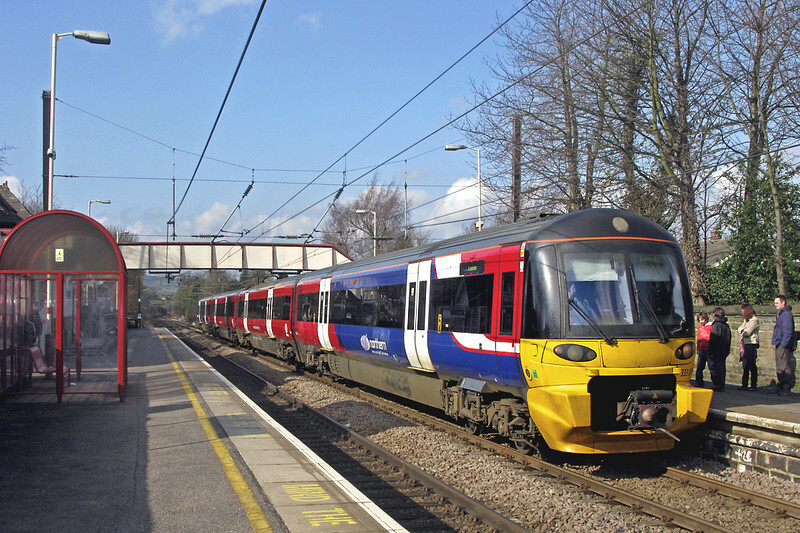 I went for a photo of a 150 on the Blackpool South line and then returned to look out for 002 again but it had vanished. So it seems there's only one out on training this week and even that isn't going past Cleveleys yet judging by the rust on the rails beyond there through to Fleetwood. 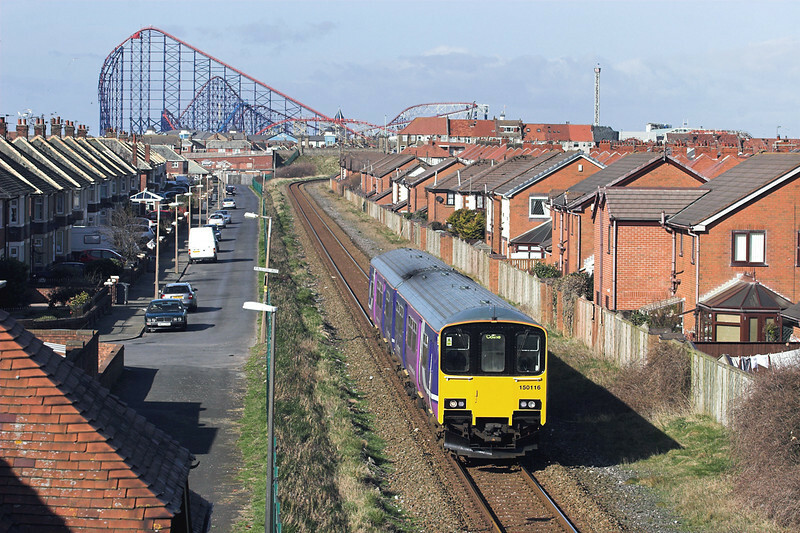 According to Blackpool Council's WEBSITE the line will be open on April 3rd from Blackpool to Fleetwood. I remain to be convinced seeing how much work is yet to be done and how many trams have yet to be delivered. Mind you, the site does say that the 'Timetable and Route' will be announced nearer the date. I assume then by 'route' (there only being one of course) that they aren't too hopeful about it opening in it's entirety! Failing a shot of the tram here's one of ex-London Midland 150116 newly repainted in Northern livery making its way between Pleasure Beach and Squires Gate. That was Monday and with it looking sunny Tuesday dinnertime when I got up I thought maybe I should make the effort to get out again. The BBC forecast was for it to cloud over in the afternoon from the west and for once they were exactly accurate. I managed a shot of 6K05 engineers at Gisburn in the last of the sun but it had fully clouded over by the time the following log train appeared at Clitheroe. These pictures, and the other ones I took Monday can be found in my New Additions section. 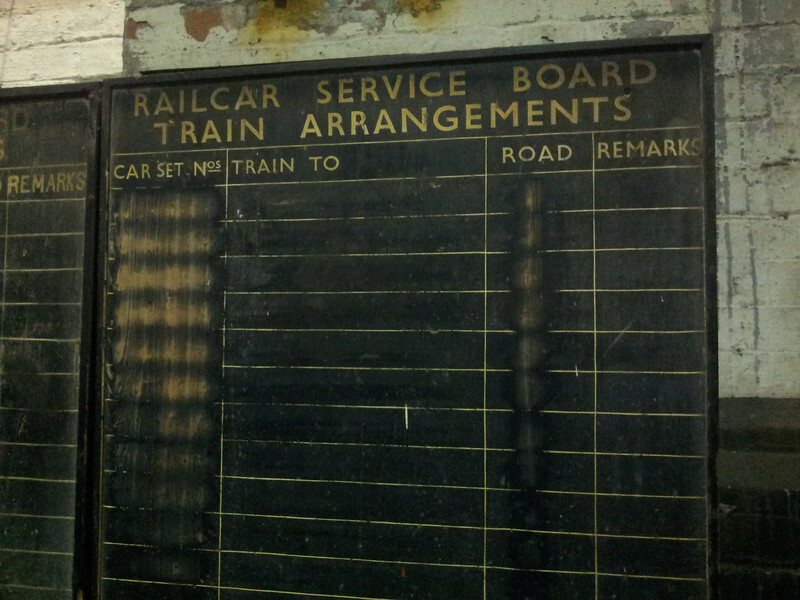 I'll leave you with this shot of a board I've just discovered at Crewe Carriage Sheds. Normally the Northern Belle rake is parked in front of it. An obviously well used board, but not I suspect since when the shed closed under British Rail in the 1980s. Thanks for reading once again, please watch out for blog number 10 in the next week or so.